Coal has a burning desire to bring great quality cuts from field to table that don’t cost the earth. Fresh ingredients cooked over hot coals or served scorching from a stone oven, our flavours are bold, interesting and healthy. Loved it! Food was great and the service was exceptional! We are happy to see you enjoyed your time with us! Thank you, and we hope to see you again. We are very happy to see you loved our burger! Thank you for the kind words. Thank you for your feedback. We still hope to see you again sometime! Thank you so much for your kind words. We can't wait to see you back! We always strive to ensure a positive customer experience at Coal. We’d love to put things right. Please, can you email [email protected] with further details (e.g. date of your visit) and we will be in touch. Excellent evening. Staff helpful , nothing was to much trouble !! Great cocktails & amazing food defo coming again . Foid was lovely staff really helpful and nice. Dear Sharon, thank you so much for taking the time to share feedback. We’re so pleased to hear you had a good time at Coal Grill & Bar and hope to see you back here soon! Fajitas were great! Passionfruit mojito was amazinggg!! Dear Chloe, thank you so much for taking the time to share feedback. We’re so pleased to hear you had a good time at Coal Grill & Bar and hope to see you back here soon! Hi Nick, thanks for your comments. It's great to hear that the food was great however I'm sorry to hear that the service was not to your expectations. We will pass this information on to the team to make sure we get it right next time. Thanks again. I love eating at Coal. The food is great, the staff are lovely and friendly and the prices are very good. Dear Mel, thank you so much for taking the time to share feedback. 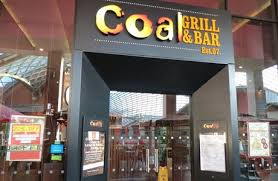 We’re so pleased to hear you had a good time at Coal Grill & Bar and hope to see you back here soon! Cocktails were amazing but food was dreadful. Despite having told staff that we had a film to see at 7.30pm. (We arrived just before 6.15pm) and being assured that this would be no problem, we had to wait 45 minutes at least before food arrived and this was only after complaining. This time delay meant that we were not able to enjoy a full meal with a dessert, because we had to leave for the cinema. The staff were apologetic but were unaware of our wait and requirements until I got up to complain. The waiter who had taken our order had gone off his shift and so continuity was lacking. Hi, thank you for the great review. We hope to see you back again soon! Great people, lovely food and service. Laura was a fantastic waitress - very kind and helpful. Food was good too and at a good price. I was not too happy with the 17% service charge that was added to the bill. I always leave a tip if the service is good, it was good and I did leave a tip but not 17%. Hi, thank you for your feedback, great to hear that you enjoyed your visit. We hope to see you again soon!